As I explained the other day when describing typesetting outputs, the days when authors received their proofs on what looked like a giant toilet roll are long gone. Today, everything is output as PDF files, which then can be printed onto ordinary (A4 or US Letter) paper. 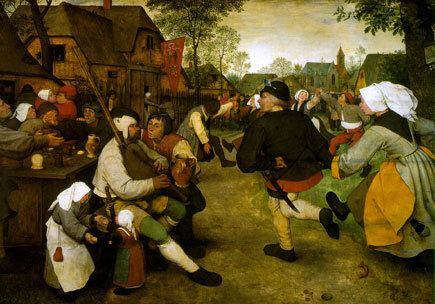 Some more traditionalist presses may still only deliver hard-copy proofs to their authors. Increasingly, however, the actual PDFs are being sent. 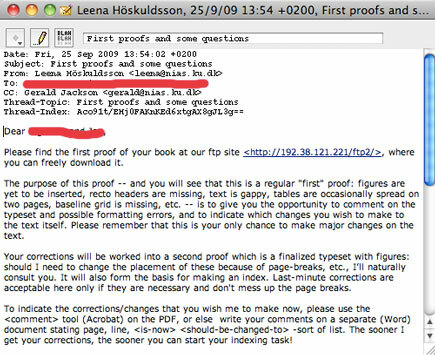 For authors, it is with the latter that a big revolution has occurred in recent years – with the development of these ‘soft’ PDF proofs. These can be read by anyone, using any type of computer, with the free Adobe Reader program. 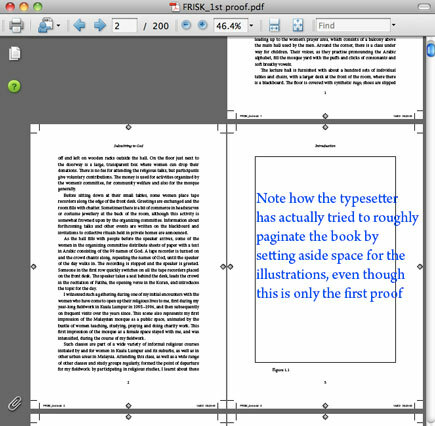 Editing of a PDF file is another matter; this is also possible but only with the full (paid-for) Acrobat program. Initially, the limitations of Adobe Reader meant that authors could only print off the proofs and mark up any changes on the hard copy. These would then be faxed or mailed back to the publisher. 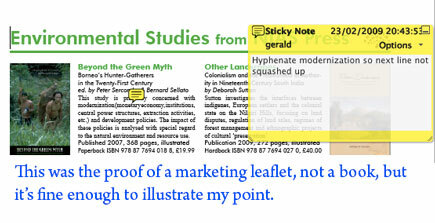 Nowadays, however, it is possible to annotate PDF files without having to own a copy of the full Acrobat program; even in Adobe Reader, one can now highlight text and add yellow ‘sticky’ notes, for instance. Such annotated PFDs can simply be emailed back to the press. Some authors can get far more creative than this. 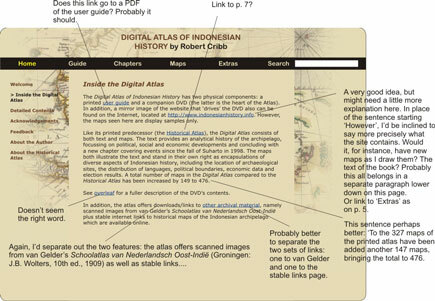 For instance, the prototype of Robert Cribb’s Digital Atlas of Indonesian History (finally delivered to the printer last week, hence my long silence this past fortnight) was created in InDesign and output as PDFs for the author to respond to. This he did by bringing the PDFs into CorelDraw and annotating them there, returning his feedback as JPEG files. Adobe now also allows publishers (and anyone else with the full Acrobat program) to create special PDF proofs. These can be edited by their recipients, even if all that they are using is Adobe Reader. At NIAS Press, however, we have not adopted this proofing feature. Personally, we don’t think that editing a PDF file gives good results or indeed is a good idea; better simply to annotate the PDF file, do the editing in the actual typesetting documents, and then output new, ‘clean’ PDFs. As you can see, there are several ways to proof your book. I pick up on this later in the week with fuller details on making your proof corrections. But whichever method you adopt – working with paper or PDF – it sure beats the hell out of using toilet paper!